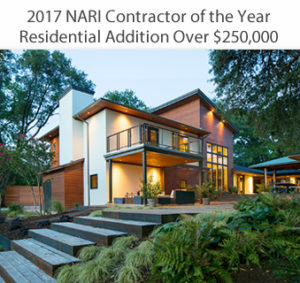 The National Association of the Remodeling Industry (NARI) named Capital Renovations Group, Dallas, Texas, the 2017 National CotY winner in both the Residential Addition over $250,000 category and the Residential Exterior under $100,000 category during its annual awards competition. Watch the award videos live on our Awards page. Earlier this year, NARI named 172 Regional CotY winners with 27 team members who advanced as finalists to the national level. 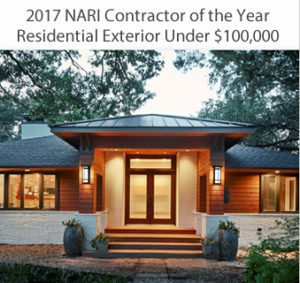 NARI announced a National winner in each of the 37 categories at its Evening of ExcellenceSM reception, held in Scottsdale, Arizona. 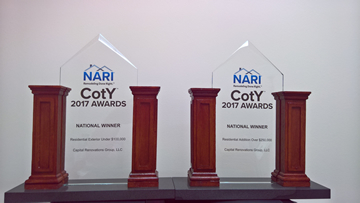 NARI presents CotY awards annually to members who have demonstrated outstanding work through their remodeling projects. These award-winning projects exemplify Remodeling Done Right, which is NARI’s promise to members, the remodeling industry and consumers alike. This year, nearly 400 entries were submitted in the competition totaling more than $103 million worth of remodeling projects. NARI is a professional association whose members voluntarily subscribe to a strict code of ethics. To be considered for a CotY Award, a company must be a NARI member in good standing.